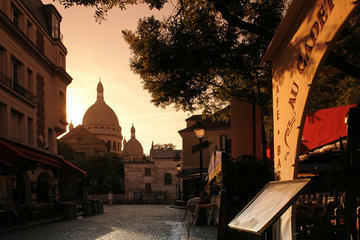 Montmartre has captivated Bohemian artists since the Belle Epoque and continues to delight tourists today. Perched on a hilltop, Montmartre is a world apart from the rest of Paris despite being the 18th arrondissement (Abbesses Métro station). Montmartre has a unique ambience. Joie de vivre is everywhere - at merry-go-rounds, quaint sidewalk cafés, and impromptu street performances. Tourists flock to the stunning Sacré-Coeur Basilica on the highest point of Mont Martyr, where the martyr Saint Denis was buried. The Sacré-Coeur may have a somber atmosphere inside the sanctuary, but outside, it's a joyful celebration of life. Visitors enjoy the view from the Basilica's terrace, a favorite place to pose for photos; others lounge on the grassy esplanade while listening to street musicians. A few steps away are the open-air art gallery of Place du Tertre and several museums displaying works by Renoir, Picasso, Dalí, and Toulouse Lautrec, who made this neighborhood an artists' colony. Take time to wander the stone-paved lanes and discover old churches, hidden squares, little bakeries, and inspirational ateliers. There are so many things to do here that you could spend several days exploring Montmartre. The Sacré-Coeur is one of the city's great landmarks, towering above Paris from high on the Butte Montmartre. The church was created after the Franco-Prussian War as a symbol of hope. The Romanesque and Byzantine-style Basilica has multiple domes (resembling a decorative layer cake), earning it the nickname of the "Wedding Cake." Inside, the striking Christ of the Sacred Heart ceiling mosaic welcomes worshippers into the sanctuary. The interior is illuminated with many candles giving it an aura of spirituality. The Basilica has a Grand Organ, played regularly at Mass and for a Christmas Eve Organ Concert. Otherwise the Basilica is dedicated to silent prayer. A highlight of visiting this famous attraction is the view from the Basilica's Dome. In clear weather, it's possible to see the Notre-Dame, Centre Pompidou, and Opera House. Access to the Dome is outside the basilica on the left, up a flight of 300 steps (no elevator). The Basilica's Terrace and Esplanade also offer panoramic views. This lively area is often filled with street musicians and people relaxing on the grass. Below the church at the Place Saint-Pierre, there is an old-fashioned carrousel (merry-go-round). To arrive at the Sacré-Coeur, walk from Place du Tertre to 35 Rue du Chevalier-de-la-Barre. Alternatively, from Rue du Cardinal Dubois, take the steps or the two-minute funicular ride. Packed with colorful artists' stalls, this picturesque stone-paved square is an open-air art gallery that effuses the creative spirit of Montmartre. Visitors will find all kinds of painters, portraitists, and caricaturists, although much of the work is designed to be tourist souvenirs. The square is also lined with lovely 18th-century buildings featuring busy restaurants, crepe stands, and cafés. Many places have outdoor seating, allowing tourists to soak up the scene. Even when packed with tourists, the Place du Tertre does not lose its charm. Standing in the shadow of the Sacré-Coeur and shaded by ancient trees, the Place du Tertre has the feel of a provincial square. It was the main square of the medieval village before Montmartre became incorporated into Paris. The house at Number 3 on the square was the "Mairie" (town hall) of the old village. The narrow lanes surrounding the Place du Tertre invite visitors to explore. A few steps away, behind the Place du Tertre, is the Eglise Saint-Pierre de Montmartre at 2 Rue du Mont Cenis. This church is the relic of a 12th-century Benedictine Abbey, however the history dates back further. The Church of Saint-Pierre was built on the site of a 7th-century (Merovingian era) house of worship, which was constructed over an ancient Roman temple dedicated to Mercury. The interior has preserved some of the architectural features of the original Merovingian church, including the four black marble columns in the choir and at the west end of the nave. Besides its 7th-century vestiges, the Church of Saint-Pierre exemplifies Early Gothic architecture; the choir was consecrated in 1147 in the presence of the great Catholic reformer Bernard of Clairvaux. Discover the Bohemian past of Montmartre at this wonderful museum a few steps away from the Place du Tertre. Housed in an elegant 17th-century mansion, the Musée du Montmartre offers a nostalgic view of earlier days in Montmartre. The museum is the actual location of a meeting place that once attracted numerous artists. Auguste Renoir had his studio here, along with Suzanne Valadon and other artists including Émile Bernard and Raoul Dufy. With its extensive collection of art dating back to the 1880s, the Montmartre Museum recounts the history of Montmartre and brings to life the creativity of this special quarter of Paris. The museum displays the work of Montmartre's celebrated artists including Modigliani and Vuillard as well as the Nabis, Fauvist, and Symbolist painters. Among the famous works on display are the original posters for the Lapin Agile and Chat Noir cabarets. There is even a room devoted to art depicting the French Cancan dance. The works of Toulouse-Lautrec are well-represented; his pastels truly capture the Bohemian spirit of Montmartre during the Belle Epoque. Toulouse-Lautrec would draw while attending a party or watching cancan dancers perform at the Moulin Rouge. Many of his works feature unconventional subjects such as clowns and cabaret dancers. Surrounding the museum are the Renoir Gardens where the artist painted La Balancoire (The Swing) and Jardin de la rue Cortot. The gardens offer sensational views of Montmartre and the rest of Paris. The Place des Abbesses is a lively square featuring the prettiest Métro station in Paris - the decorative Art Nouveau entrance was designed by Victor Guimard. Opposite the square is the Eglise Saint-Jean-l'Evangéliste (by Anatole de Baudot, 1904), a simple brick-faced church that serves the local community. Nearby streets of Rue Yvonne le Tac and Rue des Trois Frères have trendy cafés, stylish tea salons, and quaint boutiques. Many restaurants in this area feature live entertainment, sometimes a classic accordion or jazz performance. For a scenic tour, take an off-the-beaten-path walk from Place des Abbesses up to the Sacré-Coeur. After exiting the metro, as you're facing the church, turn right and walk over to the Passage des Abbesses pedestrian street, continue through the arched entry and then up a flight of steep steps, ascend the hill toward Rue Berthe, which takes a dip down the hill and then back up again. Along the way, the side streets and stairways lead to quiet traffic-free areas that reveal the old village of Montmartre. Here, the locals spend time at the outdoor cafés, and kids play games of pick-up soccer in tiny squares. From Rue Berthe, continue walking up the stone streets to the Place du Tertre. At this unique museum, visitors can delve into the curious and intriguing world of Salvador Dalí. Fittingly, the museum lies in the heart of Montmartre a few steps away from the Place du Tertre, the center of Montmartre's art scene. The Espace Dalí reveals the creative genius of the famous surrealist artist. The Espace Dalí is the only museum in France entirely devoted to the work (paintings, sculptures, and graphics) of Salvador Dalí and boasts the world's best collection of his sculptures. Many of the artworks illustrate characters from literature such as Romeo and Juliet, Don Quixote, and excerpts from the Bible. Visitors will be awed by the artist's renowned sculptures: Venus de Milo (Dalí's version), the unusual Femme Girafe and a mysterious rendition of Alice in Wonderland. The classically inspired Femme Rétrospectif was Dalí's first sculpture. The Espace Dalí is associated with another art museum, the Gallery Montmartre found at the Place du Tertre. This gallery displays a wide range of artwork in a splendid space; the gallery windows offer gorgeous views over the Paris skyline with beautiful rooftops in the foreground. This peaceful square hints at the atmosphere of Montmartre when it was a little provincial village. Shaded with ancient trees, the spacious square feels far away from the Parisian metropolitan area. At the corner of Rue Saint-Vincent and the steep street Rue des Saules is a historic house associated with the Bohemian artists of Montmartre. Look for the wording "Lapin Agile" painted on the side of the building. This establishment dates to 1875 and took its name "Lapin Agile" ("Agile Rabbit") from a poster painted by André Gill that depicted a rabbit jumping out of a cooking pot. At the turn-of-the-century, this area of Montmartre was the haunt of avant-garde artists, poets, writers, actors, and singers. Famous artists such as Toulouse-Lautrec, Picasso, Modigliani, Max Jacob, and Guillaume Apollinaire gathered here, providing artistic inspiration to one another. When wandering around the alluring old streets of the Carré Roland Dorgelès, visitors are transported to a scene of Montmartre's Bohemian past - when the spirit of creativity flourished. The village of Montmartre was once graced with many windmills but they were all taken down except for two: the Moulin Blute-Fin and Moulin Radet, which date back to 1717. Together, these two remaining windmills are known as the Moulin de la Galette, a nostalgic reminder of Montmartre's old windmills. 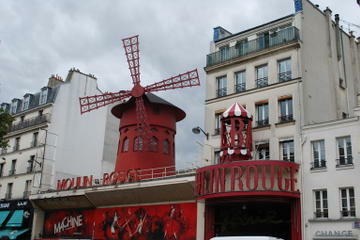 The Moulin de la Gallette provided inspiration for a number of painters including Renoir and Van Gogh. Renoir's famous painting Le Bal du Moulin de la Galette shows a festive scene at a traditional ball, and the Moulin de la Galette is seen in the painting's background. This celebrated Renoir masterpiece is found at the Musée d'Orsay. A visit to these windmills is best combined with a good meal at the Moulin de la Galette Restaurant. Offering traditional French cuisine, this historic brasserie restaurant is right below the windmills. The restaurant's pleasant terrace features a cheerful setting, with a view of the Moulin de la Galette. Also nearby is the upscale pastry shop, Pâtissierie du Moulin de la Galette (48 Rue Caulaincourt) that offers classic French pastries such as eclairs, fruit tarts, and millefeuille (layers of puff pastry and cream). Opened in 1825, Montmartre Cemetery covers more than 11 hectares, the third largest in Paris and perhaps the most romantic, not only for its landscape but for the tombs, memorials, and chapels. This air of romantic melancholy is intensified by the somewhat overgrown look of many of its monuments and by the hauntingly beautiful sculptures that adorn others. Among the tombs are those of many of the artists who lived in Montmartre during its golden years. They represent all the arts: the painter Degas; dancer and choreographer Vaslav Nijinsky; composers Jacques Offenbach and Hector Berlioz; writer Alexandre Dumas; and Marie Duplessis, Countess of Perregaux, who inspired his immortal heroine Camille. The Bateau-Lavoir is a historic atelier where famous artists Picasso, Braque, and Juan Gris created their masterpieces. In this unassuming little building that was once a piano factory, the art of Cubism was brought to life. Many artists had their studios in this house, lived here, or came as visitors (in addition to Picasso, Braque, and Juan Gris) including Paul Gauguin, Otto Freundlich, Max Jacob, André Salmon, Brancusi, and Modigliani. Picasso moved here in 1904 and a year later painted his sublime and surprising Demoiselles d'Avignon painting, the first Cubist picture. Back in those days, at the turn of the century, the house had no electricity, heating, or running water. The atelier has since been rebuilt, replicating its original form, after being destroyed by a fire in the 1970s. The building is still used as apartments and artist studios. The Bateau-Lavoir is on the delightful tree-lined square, the Place Emile-Goudeau. Before the square had a name of its own, the address of Bateau-Lavoir was 12 Rue Ravignan. This charming museum celebrates the Romantic era in Montmartre. Romanticism was an artistic movement (focused on imagination and expressiveness) that swept through Europe and influenced the artists of Montmartre in the 1830s. During that period, the Dutch painter Ary Scheffer turned his elegant villa, the Hôtel Scheffer-Renan, into a salon. George Sand, Frederic Chopin, Eugène Delacroix, Franz Liszt, Jean-Auguste-Dominique Ingres, Alphonse de Lamartine, and Ivan Turgenev were habituées of the salon. The museum occupies the Hôtel Scheffer-Renan and evokes the historical ambience with period portraits, decor, and furniture. The ground floor is devoted to the novelist George Sand. The first floor displays Ary Scheffer's paintings as well as works by contemporary artists. There are also numerous mementos of the artists and literary figures who frequented the salon. Throughout the year, the museum hosts temporary exhibitions, concerts, book readings, and children's activities. From March through October, the museum opens up its lovely tearoom in the garden's greenhouse. Visitors will enjoy the delightful patio setting for afternoon tea and snacks. Bordering the Montmartre neighborhood in the 9th arrondissement, this museum is worth a detour for those who appreciate the art of Gustave Moreau. This museum was the residence and studio of Gustave Moreau from 1826 to 1898. The museum displays an extensive collection of Moreau's works, including around 1,000 paintings and 7,000 drawings. Gustave Moreau was a Symbolist Artist renowned for his romantic, whimsical, and fantastical style. Many of his paintings feature the theme of classical mythology, and others have a dreamlike quality. The museum has kept Moreau's study in its original state. This innovative museum offers a more modern perspective of the Montmartre art scene, with a permanent collection of Max Fourny's artwork. The museum is at the foot of the Butte Montmartre in the Halle Saint-Pierre, a cultural center that opened in 1986. The building was originally designed as a marketplace but now is used as an exhibition center and a venue for cultural events. Max Fourny is known for his naïve (folk) art, also called "art brut" ("raw art"). The collection includes more than 500 paintings and 80 sculptures. The museum at the Halle Saint-Pierre also features other exhibitions of folk art from around the world. While Montmartre might not be the most central place to stay, its narrow, winding streets make it one of Paris's most atmospheric neighborhoods. And its steep terrain means that hotels such as the modern Terrass'' Hotel by MH have sweeping views from their upper-floor balconies and rooftop terrace. The warm and comfortable Le Relais Montmartre is only a few steps from the Metro, as is the Hotel Declic, which has lush rooms in a quiet corner of Montmartre, only a 10-minute walk from Sacre-Coeur. The lovely and romantic boutique hotel Montmartre Mon Amour offers complimentary afternoon tea to its guests. Budget Hotel Basss by HappyCulture is also only a short walk from Sacre-Coeur and handy to the Blanche Metro stop and plenty of restaurants and cafés on busy rue des Abbesses. Tours of Montmartre: Get an in-depth view of the hill's Bohemian spirit and history as you explore artists' and writers' former haunts with an expert guide on a two-hour Montmartre and Sacre Coeur Walking Tour in Paris, which includes a visit to Montmartre Cemetery and places immortalized in paintings by Renoir and Toulouse-Lautrec. Or delve more deeply into the work of the Impressionist artists who lived and painted here on a Montmartre Impressionist Art Walking Tour Including Skip-the-Line Musee d'Orsay Ticket. This tour not only visits the landmarks they painted and the places that inspired them but includes a chance to later view their paintings in Paris' largest collection of Impressionist art, the famed Musée d'Orsay, at your leisure without having to wait in line. Exploring Montmartre: Distances on maps of this part of Paris can be deceiving, as they don't show the steep terrain. Although a map is handy for street names if you're looking for a specific address, if you're merely exploring the neighborhood, it's better to wander and look forward to getting lost and making your own discoveries.